Bac Giang (VNS/VNA) - Local authorities in the northern province of Bac Giang have started initial steps to restore ancient relics on the West Yen Tu mountain range, where King-Monk Tran Nhan Tong (1258-1308) studied and practiced Buddhism. According to Le Anh Duong, Vice Chairman of the Bac Giang People’s Committee, through many years of research, the concerned agencies have proved there is a connection between Vinh Nghiem Pagoda in Yen Dung district, which was built in the 11th century, and a series of ruined pagodas, temples and towers in the west of Yen Tu range. After more than 700 years of development, the Truc Lam Yen Tu Zen school has promoted the principle of embracing life and of leading a religious life while fulfilling a citizen’s responsibility for national construction and development. “The province wants to restore the relics as a way to rebuild the King’s Buddhism practise and add more tourism spots for today’s Buddhists and travellers,” Tran Manh Ha, Director of the provincial Department of Culture, Sports and Tourism told Vietnam News. Venerable Monk Thich Truc Thai Minh, head of Ba Vang Pagoda in the northern province of Quang Ninh has proposed authorities let his team conduct examinations at the site to implement the project. Ten relics located in two districts of Luc Ngan and Luc Nam of Bac Giang province will be the key spots for the restoration project. 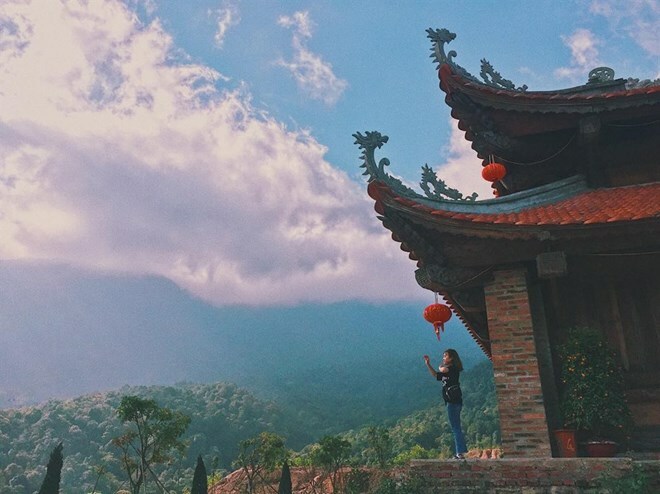 “The project aims to open in each ruined pagoda on the way up on West Yen Tu range a traditional Truc Lam Yen Tu School and restore localities’ festivals,” said Venerable Monk Minh. The pagodas to be renovated including Ma Yen, Hon Thap, Binh Long will link with the West Yen Tu Culture Spiritual Tourism Site in the same province, which was constructed in 2014 and is expected to be completed by 2025; and the Yen Tu Landscape Complex in the east side of Yen Tu range into a large-scale religious complex, restoring Truc Lam Buddhism School holy land, according to Ha. The authorities of Bac Giang will support investors in legal procedures, moving locals out of the allocated areas and building roads to the relics, Duong confirmed. In a few months time, authorities in two districts of Luc Ngan and Luc Nam will ask for locals’ opinions on implementing the projects, he said. Ha said the authorities will mobilise private capital for the project. Hence he was not sure when the project will be completed. “Maybe in ten to twenty years time,” he added. According to the provincial Department of Culture, Sports and Tourism, Monk King Tran Nhan Tong started his study of Buddhism from the west of Yen Tu range (of today’s Bac Giang province). His followers Phap Loa and Huyen Quang followed his steps on the west of Yen Tu range to practice the Truc Lam Zen Sect. Early monks of the sect built pagodas, towers and spread Buddhism throughout Bac Giang province, where today remain 2,000 historical and cultural sites with various holy pagodas and temples like Am Vai, Binh Long, Yen Ma, Son Thap and Dam Tri. Vinh Nghiem Pagoda has been recognised as a Special National Relic Site, which hosts a stock of thousands of wood printing blocks teaching Buddhism that has been listed as a World Documentary Heritage by UNESCO. “With such a large number of relics, the West of Yen Tu range has been considered as the birthplace of Buddhism between the 11th and 14th century, which hosted the first Buddhist Sangha of Vietnam,” said Venerable Monk Minh. In 2015, three provinces of Quang Ninh, Bac Giang and Hai Duong locating under Yen Tu mountain range submitted to the government a list of destinations of Tran dynasty’s relic sites and Truc Lam Yen Tu Buddhism Zen Sect to seek the government’s recognition. The complex includes Yen Tu Historical Relics and Landscape (in Uong Bi city, Quang Ninh province); Tran Dynasty’s Relics Sites in Dong Trieu commune, Quang Ninh province; Thanh Mai - Con Son - Kiep Bac Historical and Cultural Site in Chi Linh city, Hai Dương province; West Yen Tu Relic Sites in Bac Giang province.